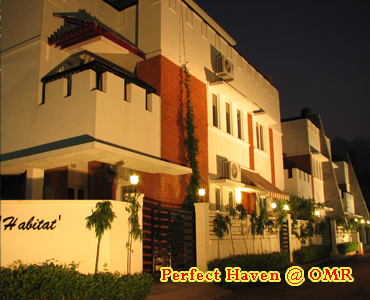 Perfect Haven @ OMR Serviced Apartments in Chennai is situated right in the heart of the IT corridor, just off the OMR near Perungudi, behind Apollo Hospitals (Earlier Lifeline Hospital) and on the way to the SIPCOT IT Park. Perfect Haven @ OMR Serviced Apartments in Chennai is within minutes of Tidel Park and Ascendas IT Park and walking distance from RMZ Millenia Business Park, SP Info City and the American International School, Chennai. The areas of Velachery, Adyar, Valmiki Nagar, Thiruvanmiyur and the ECR are all nearby and easily accessible from Perfect Haven @ OMR Serviced Apartments in Chennai. Perfect Haven @ OMR Serviced Apartments in Chennai is about 3.6 km from IIT Madras, 17.4 km from the airport, 16.2 km from the Railway Station and about 12 km from the US Consulate and the Gemini Flyover. Perfect Haven @ KNK Serviced Apartments in Chennai comprises individual apartments housed in an upscale, multi-storeyed, residential building, with 24-hour security, called Brindavan Apartments located at Khader Nawaz Khan road, Nungambakkam. Perfect Haven @ KNK Serviced Apartments in Chennai is spread across about 3,500 square feet, has 3 spacious bedrooms with attached bath and offers separate, fully-furnished Living, Dining, and Entertainment areas and a fully-equipped Kitchen. Perfect Haven @ KNK Serviced Apartments in Chennai are contemporary in design and come with wooden and vitrified tile flooring, plush furnishing and high-end fixtures and fittings. 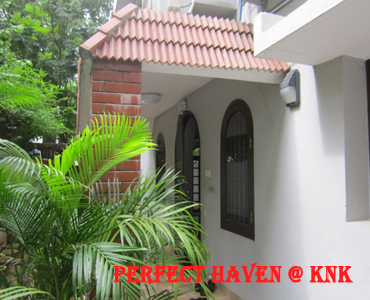 Perfect Haven @ KNK Serviced Apartments in Chennai is located at Nungambakkam, in the heart of central Chennai, very close to the Central Business Districts of Mount Road (Anna Salai) and Nungambakkam, within walking distance of Chennai's many hotels and restaurants. In terms of distances from key locations, Chennai US Embassy is 1 km from Perfect Haven @ KNK Road, and Spencer Plaza Mall & Express avenue malls are 1.3 km from the property. Chennai International Airport is 12.9 km away. 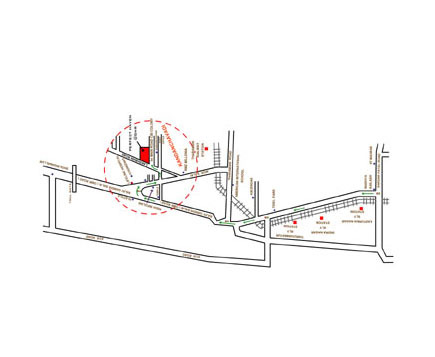 Khader Nawaz Khan Road, Nungambakkam, Chennai – 600 006. Our top-notch business class Serviced Apartments and Corporate Residences are located in the heart of Chennai, immaculately designed, elegantly furnished and serviced to the highest standards. Perfect Haven Serviced Apartments in Chennai combine the comforts of a home with services of an international standard hotel and offers a real "Home away from Home" ambience retaining its own special charm, independence and flexibility. Luxuriously furnished, fully air-conditioned rooms with TV and cable connection, Wi-fi internet connectivity, a mini fridge, designer bathrooms and comfortable beds to stretch out on, make Perfect Haven Serviced Apartments in Chennai the ideal place to stay. We cater exclusively to companies � our clientele ranges from large multi-nationals to mid-sized corporates. Our Corporate Residences offer significant cost savings and flexibility to companies that use star hotels. Our guests are senior and mid-level corporate executives who most often have a budget to stay in 4 and 5-star hotels but have consciously and consistently chosen us over these hotels because we provide similar comforts and more personalized service at lower prices @ Perfect Haven Serviced Apartments in Chennai. If you are looking for a service apartment in Chennai that's priced right and located centrally, and can help you feel connected while away from home on your long business sojourns, then Perfect Haven Serviced Apartments in Chennai provides a great solution. So, the next time when you are in Chennai looking for a perfect business trip or moving to the city and need a place to stay before you find your own perfect home, make sure you stay at Perfect Haven Serviced Apartments in Chennai.